Until the early 1980's, one method of termite treatment dominated the industry both in the United States and throughout the world. That method consisted of applying chlordane or something very much like it around and under the home to create an unbroken "chemical barrier" that prevented the termites from getting from the soil to the house. Chlordane belonged to a group of chemicals called organochlorines, which also included DDT, aldrin, dieldrin, heptachlor, lindane, methoxychlor, and a few others, almost all of which are illegal or highly-restricted today. But it worked great. There are still many, many buildings that were treated with chlordane more than half a century ago that are still termite-free all these years later. Chlordane was applied using a pump, hoses, and a fearsome collection of drills, rods, valves, nozzles, injectors, and other gadgets that were designed to get the termiticide where it needed to be. It was crucial that the barrier be continuous, and termite technicians had a tool for every conceivable situation. Between the 1960's and the early 1980's, chlordane and the other organochlorines began to come under increasing scrutiny, largely due to the publication of the book Silent Spring by Rachel Carson. The first of the organochlorines to go was DDT because it was known to harm wild bird populations and was believed to have adverse human health effects. Most of the rest followed, one by one, until all the organochlorine insecticides were either banned, withdrawn from the market by their manufacturers, or severely restricted. In April of 1988, chlordane, too, was banned and became just another chapter in the history of pest control in the United States. Chlordane initially was replaced by a long procession of other repellent liquid termiticides that were applied using the same methods. None of them worked very well. Chlordane had some unique characteristics that made it ideal for termite control, perhaps the most important being that it stayed put. It didn't leach much, if at all. As long as the barrier that was applied was not disturbed by subsequent construction or landscaping, a chlordane application virtually guaranteed that a home would never have termites again. None of the early replacements were anywhere near as effective as chlordane had been. Practically all of the "chemical barrier" products are now gone. None of them worked very well, anyway; and a few of them (like chlorpyrifos) were withdrawn due to health concerns. Non-repellent liquid treatments such as Taurus® and Premise® are applied with similar tools as those used for chemical barrier treatments, but they work in a completely different way. Older "barrier" termiticides really didn't kill termites so much as repel them. The termites that were present at the time of the treatment would die, but "new" termites simply avoided the treated areas. Non-repellent liquid termiticides work in the opposite way. They're designed to be undetectable to termites so the termites will freely move through the treated areas without a care in the world. What the termites don't know is that the soil they're traveling through actually contains a very slow-acting toxicant that they're carrying back to their nests; and because of the highly-social nature of termite colonies and the fact that the workers feed all the other castes, the entire colony is being slowly poisoned. Within a few weeks after treatment, the entire colony will be dead. Not just repelled. Dead. Whether or not liquid termiticide treatment is a viable option for do-it-yourselfers is questionable. In most places, it's illegal for unlicensed persons to apply liquid termiticides into the soil; and even where it's legal, it almost certainly won't satisfy mortgage companies or others who insist on professional treatment by licensed pest control companies. It certainly won't be acceptable by the VA, FHA, HUD, USDA, or other mortgage guarantors. Applying liquid termiticides also requires not only a whole lot of specialized equipment, but also specialized skills that most folks simply don't have. But if it's legal where you live, if you have access to the equipment, and if you want to give it a shot, I urge you to read this manual by the USDA first. It provides an excellent introduction to the basics of termite control. Several companies manufacture termite baiting systems that use solid baits rather than liquid treatments. Some of the more popular baiting systems include the Advance Termite Baiting System by BASF, the Hex Pro Termite Baiting System by Dow, and the Terminate system by Spectracide. Where it's legal, termite baiting is a much more realistic approach to do-it-yourself termite control. It's simpler, safer, and requires fewer tools. The only tools you'll need are an earth auger with a bit in the size corresponding to the baiting system you use, possibly a core drill and bit if you have to drill through concrete, and a key to open the bait stations (which is usually included with termite baiting kits). Termite baiting itself is legal in all U.S. states that have termites and is a relatively simple and practical DIY termite-control solution; but installing a termite baiting system yourself may or may not be legal, depending on where you live. Some states restrict the use of these systems to licensed professionals. In addition, not all of the active ingredients used in baiting systems are legal in all states. Some states routinely approve all active ingredients that have been approved by the federal EPA, but other states require pesticides to be also receive state approval. Using an unapproved pesticide -- even a low-hazard one like a termite bait -- is a criminal offense in most jurisdictions; so be sure to check your state and local laws before buying or installing a termite baiting system. Finally, few banks or lenders will accept DIY termite control as satisfying requirements for a mortgage or home equity line of credit. If a lender is involved, you'll almost certainly need a licensed pest control company to do the job. All that being said, termite baiting is actually pretty easy. It consists mainly of placing bait stations in the ground around the house at intervals specified by each system's manufacturers. 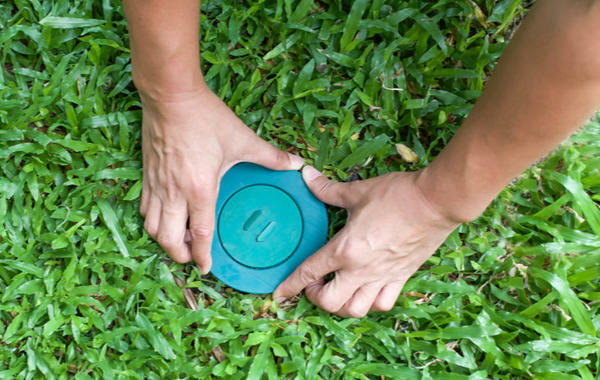 Most professionals who use termite baiting systems place them every 8 to 10 feet (every 2.4 to 3 meters) around the house, sometimes with extra stations near sites of known termite activity (such as old tree stumps, for example). The stations are installed directly into the ground (or in holes bored through concrete patios, if necessary) with their tops flush with the surface. The bait stations contain cellulose matrix cartridges or inserts that are more palatable to termites than ordinary wood. They don't really "attract" foraging termites from any great distance; but when the foraging workers happen to come across the bait cartridges, they usually prefer them over other wood. The matrix cartridges are richer in the components of wood, especially cellulose, that termites need. They're like energy bars for termites. Most baiting systems start the process using "monitoring" or "inspection" cartridges that contain only the bait matrix and no toxicant. The cartridges are replaced with the toxicant cartridges only once termites have started feeding on the bait. Other systems use active cartridges with the toxicant right from the start. Either way, the idea is the same: When the termites start eating the bait that contains the toxicant, they carry it back to their nests and feed it to the rest of the colony. Within a few weeks to a month or so later, the colony should be dead. Direct wood treatment for termites is another approach to termite control, but it's not very practical as a standalone termite control method in an existing home. It would be difficult or impossible to get the product to the most vulnerable parts of the home such as inside wall voids or on the bottom of the sill plates. But it's an outstanding solution for pre-treatment of new structures or extensions to existing ones. Two products, both made by the same manufacturer and both using the same active ingredient (disodium octaborate tetrahydrate, a very low-toxicity borate product), dominate the direct wood-treatment market. Tim-Bor Professional has a very permissive label and "can be applied as a dust, spray, foam or mist onto wood and cellulosic materials or inside wall voids, cracks and crevices," according to its manufacturer. 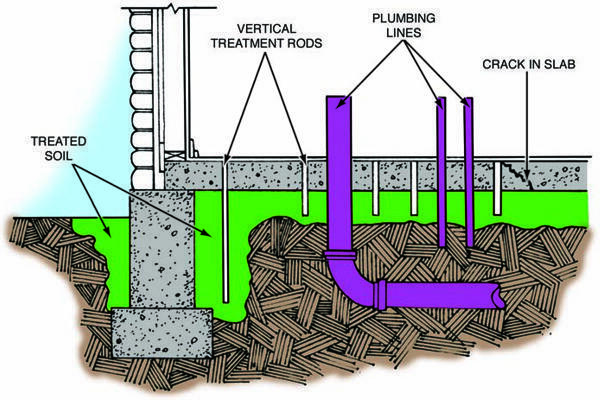 It's not registered as a primary or sole pre-construction termite treatment, however. It has to be used in conjunction with other treatments, such as liquid or bait treatments of the soil. BORA-CARE has a much more restrictive label and is almost always applied as a spray. Because it's very thick stuff even at use dilution, it has to be applied using a heavy-duty backpack sprayer or another sprayer approved by its manufacturer. The upside is that unlike its sibling Tim-Bor, BORA-CARE can be used as a primary or sole termite treatment on new construction. In addition to preventing wood damage from subterranean termites, both Tim-Bor and BORA-CARE protect wood against drywood termites, carpenter ants, wood-boring beetles, and many molds and fungi. In the case of Tim-bor the degree of protection is somewhat dependent on the application method chosen. In the case of BORA-CARE, when applied according to label instructions, the wood should be protected against pretty much anything that attacks wood. If I were building an extension, I personally would treat all the wood with BORA-CARE. I've used it many times over the years and it's never let me down. (Tim-Bor hasn't, either, but I have less experience with it.) I'd even choose BORA-CARE over treated lumber because it's just as effective and has lower toxicity than most other wood preservatives. The label instructions for using BORA-CARE to protect wood from subterranean termites are very clear and straightforward. You basically mix the product and spray it on all susceptible surfaces within two feet, vertically and horizontally, of the foundation where the sill plate will meet it. The only practical advice I'd add would be to remember to treat the cut ends of studs and other timbers within the two-foot treatment zone. The other thing I need to mention is that even though Tim-Bor and BORA-CARE are two of the least-hazardous pesticides ever manufactured, some states forbid sale of any insecticide labeled for termites, including Tim-Bor and BORA-CARE, to unlicensed individuals. Check your state and local laws before buying or applying these products. Also, as with any termite treatment, DIY methods will almost never satisfy banks, mortgage lenders, or mortgage guarantors that the house has been adequately protected against termites. If a lender or guarantor is involved, you're going to have to hire a professional.